Plenty of actors are praised for their versatility, but few earn those plaudits as completely as Zahra Newman. Her last major role was as Nabalungi in the original Australian cast of The Book of Mormon, a large-scale, bright and bold Broadway musical comedy that’s exactly the same wherever you see it in the world. 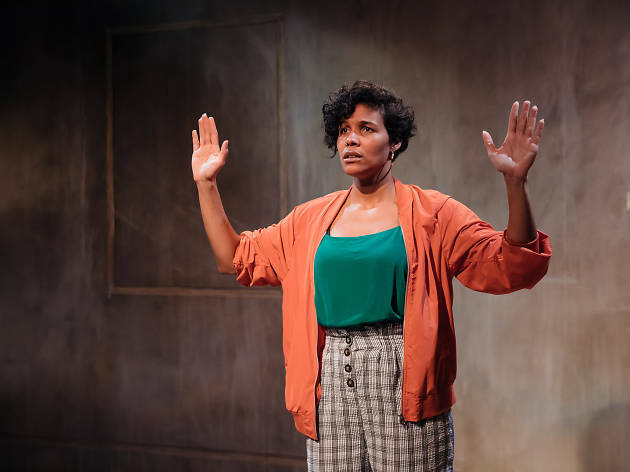 It’s hard to imagine a theatrical experience further away from that than Random, Debbie Tucker Green’s one-woman play that Newman is performing in Belvoir’s tiny Downstairs Theatre. 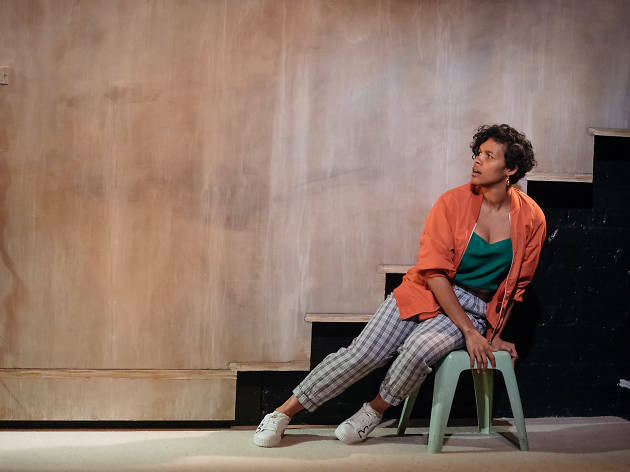 The title of the play refers to a random act of violence that blindsides and shatters a British-Caribbean family living in London. It’s just another regular day when suddenly there are policemen in their formal front room, asking unexpected questions. Suddenly they deliver a bombshell, and nothing is the same. The family struggles to understand how to respond when pushed to a crisis point they were never prepared for, and the trauma that Green reveals feels devastatingly real. 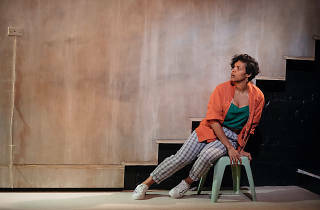 Newman plays each member of that family – a mother, a father, a sister, a brother – drawing distinctive lines between them with her physicality and vocal characterisation. But before we get to the moment of crisis, Green establishes their world with great care and gorgeous detail: the persistent office gossip at the daughter’s workplace; the mother’s cooking and preening over her kids; the father’s stoicism; and the smells of the rebellious teen brother’s room. 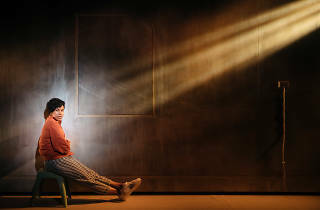 It means by the time one member of the family is unfairly snatched away, you’ve grown to care for them immensely (quite a feat for a play that only runs 50 minutes). 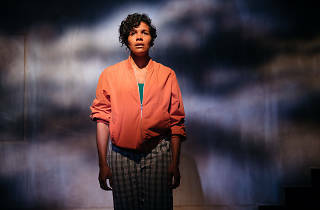 Leticia Cáceres has directed this production with a gentle hand, guiding Newman’s performance moment by moment, and supporting it with sound design from the Sweats, Jacob Nash’s evocative design, and Rachel Burke’s lighting, which transforms the downstairs theatre from location to location through abstract choices. Newman holds all of this together with heart-breaking intensity. 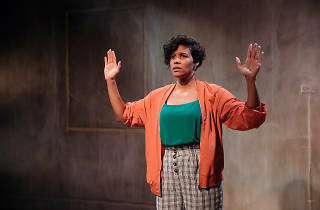 Her performance is intimate, unguarded, direct and deeply connected to the audience. 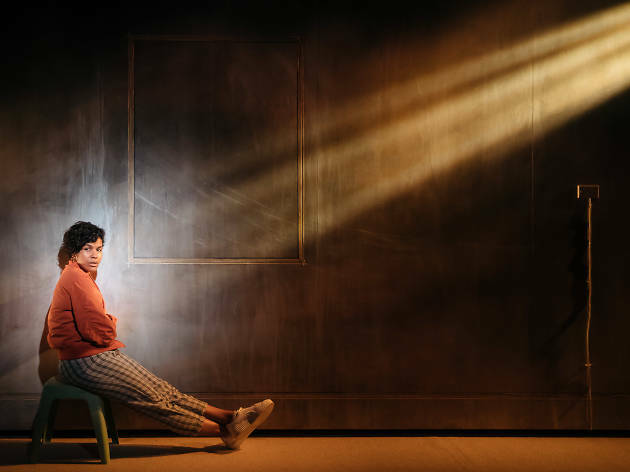 The actor and the characters become one – she simply appears to live within their skin at this particular moment in their lives; they’re all immediately recognisable, but none is a caricature. This is the type of acting you want to see pretty much every time you go to the theatre.